Yes, it's true. I...don't quite believe it—what do you do when your dreams come true? Oh, of course, champagne. What was I thinking. Just as huge news, 'our' Melina Marchetta WON the Printz, for Jellicoe Road, so it will be a big Aussie party there in Chicago come June, when the awards are presented. It's so exciting. I'm so relieved and pleased. UPDATE: It's even more official. Brisbanites, I want to see you out in force today. Yes, pounding rain and soupy air notwithstanding! I'll be reading from, and talking about, Tender Morsels, plus, you may ask any questions you like about previous books, Clarion South, and where I get my ideas. just in recovery from being crazy busy tutoring Clarion South. What a great week. Okay, so I was almost complete sedentary. But my brain was exercised almost to exploding point, and my mouth! Gab, gab, gab, I went. Story, story, story. Me, me, me. As you can imagine, I had a wonderful time. Wall-to-wall science fiction and fantasy—and, it being 3rd week, some of the fantasies were getting pretty wild. All capped off with the Aurealis Awards last night. Everyone's got to get hold of Alison Goodman's The Two Pearls of Wisdom, eh, because it's better than Tender Morsels, if you can believe that! :) I had the pleasure of accepting for Jonathan Strahan's anthology The Starry Rift, so I got to glitter (thanks to the glam scarf given to me by my Clarion students) for a tiny while in the spotlight, then to move on to champagne and more wonderful gabbing in the Judith Wright lobby afterwards. Steven flew up to Brisbane yesterday morning, and we're now staying with friends (and air-conditioning—commiserations, Clarionettes!) for the next few days, and I'm trying to adjust to conversation that is not all about my genius all the time—some of it is, but not all. Sigh. Of course it couldn't last. Oh my goodness, Red Spikes is unsavoury too! It may be a blessing that these nasty little stories are so confusingly told that the reader often has no idea what is going on; When you do get a glimmer of meaning, you'll often wish you hadn't. This is the kind of collection that makes you wonder about the author—what kind of person has this kind of perversity floating around in her head? has definitely been worth the wait [music to my ears—that was some wait] ... dense with issues of gender, psychology, and society, that makes this a very satisfying read. Small stories bump into bigger issues as Lanagan teases part themes about gender, masculinity, love and brutality. I went willingly, while those unfamiliar might need a little more time to warm to the murky depths of her prose. Murky? Never. My prose is no more 'murky' than it is 'clotted'. As with many of her fans I have waited impatiently through three marvellous collections of short stories for Lanagan to return to the novel. Now ... in spite of the sustained imaginative power and originality of Tender Morsels I find myself paradoxically missing the maturity, the compression, the open-endedness and, particularly, the rich and unpredictable variety those short stories. The Maitland Mercury reproduces the back-cover blurb beneath the heading 'Successful Novocastrian'. This despite my only having been born in Newcastle, never lived there, and having left the area, ooh, nigh on forty years ago. ... an amazing experience. But it takes work. Each of her stories is like running across sizzling tarmac and then plunging into a deep pool of clear, cold water. It's an enormous yet wonderful shock to the system, but by the time you've acclimatised you have to haul yourself out and start all over again. Time for another nap now, I think. Oh, you're asleep already? Oh. And a big lump of Tender Morsels reviews. OMG, the linkage is killing me. Well, to begin with, Tender Morsels has won the Allen County Public Library Mock Printz, which is wonderful. Also, it's had a Blue Ribbon pinned to it by The Bulletin of the Center of Children's Books, meaning that it has made all six of the best-of-year lists for the big US children's-book-reviewing journals. Can't complain about that! A review by Hilary Williamson at BookLoons Reviews: 'Though her story begins in darkness and abuse, Margo Lanagan moves it steadily and assuredly into the light, with strong (mainly female) characters, intriguing magics, and beautiful writing.' Noice. Abigail Nussbaum is disappointed that TM wasn't grimmer. Well, that's a turn-up for the books. She calls it 'a bit shapeless...but entirely fascinating'. I'm not entirely sure I agree with her that my nerve failed as she said, but she's made me think. Maybe she'll make you think, too, if you're one of those readers who's going nuts because you're the only person you know who's read it and you can't talk to anyone about it. Go over and have a look. Lisa Hannett, who'll now just be girding her loins for Week 2 of Clarion South (which I'll teach Week 3 of), thinks it's 'brilliant! I SO can't wait to meet her at Clarion!!!!!!!!!!! Even though her brilliance makes me a bit scared'. Bwa-ha! See you soon, Lisa! Oh, and did I blog that it was one of the Amazon Editors' Top Ten Picks of 2008? I may not have—that'll be minestrone-brain striking again. There are a handful of YA books this year that I have thought dark and perfect. 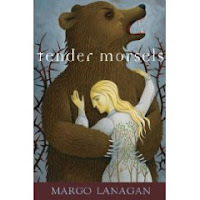 One of them is Margo Lanagan's TENDER MORSELS. Another is Cylin Busby's THE YEAR WE DISAPPEARED. I think there is some debate on whether these books are actually YA or adult. And that's it for the online reviews and mentions to date. Meanwhile, Allen & Unwin have sent me a very slick folderful of press cuttings, some of which were new to me. A few RSI-preventative stretches, and I'll get straight onto those. No linking there, at least. OF Blog calls it 'one of the best short stories I've read this year' as well as 'a powerful, emotional read'. Count Gore puts it in his Tomb Top Ten and says it's 'a ferociously horrific continuation of a well-known fairy tale that, honestly, freaked me out'. Excellent. [I]t should be clear to anyone who reads it that her goal, at which she was entirely successful, was to depict not only the physical but emotional toll of such abuse, which grinds down its victim's soul to the point where they depend on their abuser for their sense of self. And Ellen—has she no shame? :) —pimps it for a Hugo, along with every other excellent thing she's done this year. Go and vote, people. Show those Nebs voters how to do it. Right. Time to update. Black Juice first. Avert your eyes, Justine, much reviewish stuff coming. This blog is where I keep track of them, so feel free to check back later once I'm done. It's been a busy couple of weeks, in which there was a lot of Christmas and New Year family-ising and imbibery, but now I've been back at work for a week and can catch my breath and perhaps even rub two of my very own thoughts together. Indeed, each story in this collection is richly described, dark and disturbing. Almost too dark to be shelved with books for “Young People”, but what do I know? ... I will definitely read more by this author…later. Right now I’m emotionally drained. Kristin Cashore, author of Graceling, recommends BJ as a 'great book'. She says: 'I never read short stories, but these ones hooked me. Margo Lanagan has an EXCELLENT BRAIN'. Which is encouraging, when my brain has been feeling a bit like slightly off minestrone for the past three months or so. Okay, this is stoopid enough to get me blogging again. Of course, the Angel of fricking Death isn't a fantasy element, oh no. That's gritty realism all the way, that is. Also, 'just' a retelling? I don't know where this person's head is.